Brazil's national football team, known as ‘Seleção Brasileira’ in Portuguese, is controlled by the Brazilian Football Confederation and represents Brazil in international men’s football tournaments. Brazil is a member of the world federation since year 1923 and member of CONMEBOL since 1916. The national football team of Brazil is the most successful team in World Football Cups so far. 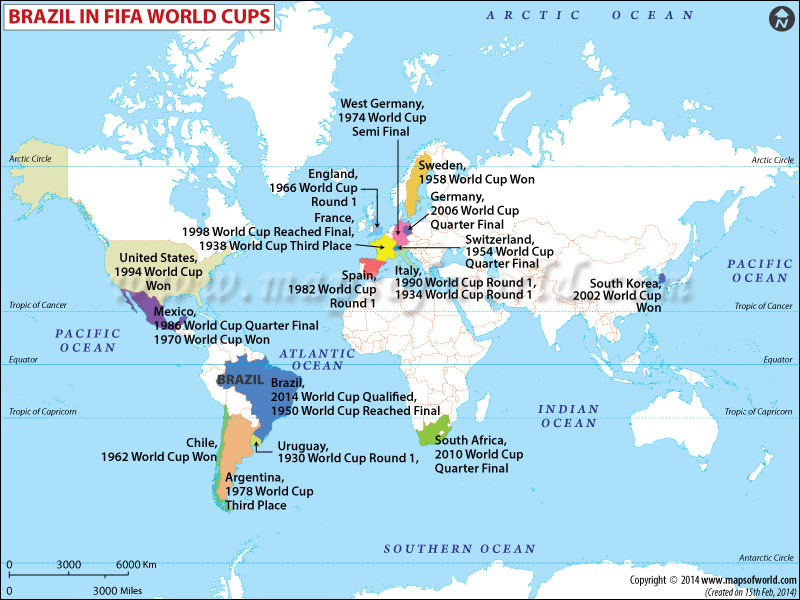 World Football Cup participation started in the year 1930 and since then the team has appeared in 20 World Soccer ﻿Cups and is the only team in the world to have played all the World Football Cups. In the Confederations Cup, the team started playing in 1997 and has appeared in 7 tournaments so far. The national football team currently holds number 1 position in World Football Elo Ratings and is placed at number 11 in the World Football Rankings. A quip common in the football world for Brazil is that "The English invented it, the Brazilians perfected it". The Olympic tournament is the only international competition that Brazil has never won. Till now, the team has managed to grab three silver medals in 1984, 1988 and 2012, and bronze medals twice in 1996 and 2008. Brazil will also host the 2016 Summer Olympic Games. Brazil, with its excellent performance has become the only team to have won World Football Cup in four different continents. They have won the mega tournament five times in 1958, 1962, 1970, 1994 and 2002 and finished runners up twice in 1950 and 1998. Brazil's national football team was able to secure third place twice in the years 1938 and 1978. The team has also performed outstandingly in Confederations Cup and won the title four times in 1997, 2005, 2009 and 2013 out of which three times consecutively (2005, 2009 and 2013). It has been performing exceptionally well in regional tournaments too. The national football team of Brazil also shares an excellent record along with Spain winning 35 official matches consecutively. Brazil is the host of upcoming World Football Cup and has thus qualified automatically for the competition.